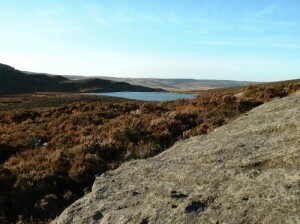 © Copyright - All walk descriptions and photos on this website are subject to copyright..
Harbottle Lake and the Drake Stone. 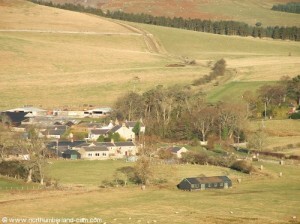 We started this circular walk from the car park just west of Harbottle Village in the Coquet Valley. 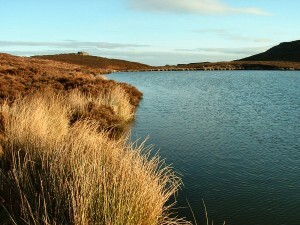 The walk provided us with great views of the surrounding countryside, a walk past a secluded lake and quiet forest. 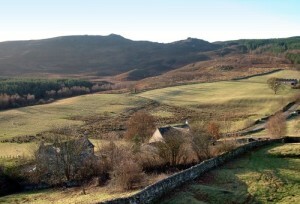 We made a short diversion at the end of the walk to the ruins of Harbottle Castle where there are more superb views in all directions. Toilets - nearest in Alwinton Village (when we were last there). Distance - 2.5 miles approx. 1) We left the car park close to the entrance from the road, turned right and walked uphill alongside the forest. 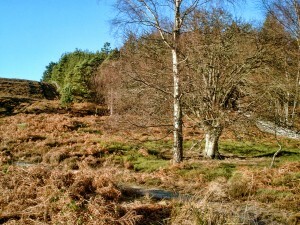 After a short distance the path left the edge of the forest and continued up a bracken covered hillside with the forest still close by to the right. 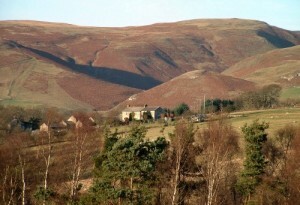 2) As we climbed up this hill we took time to turn and look back and enjoy the views over Harbottle and along the Coquet Valley. 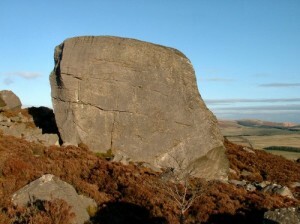 Straight ahead on the horizon we could see the very large boulder known as the Drake Stone. Legend has it that the stone has miraculous healing powers. 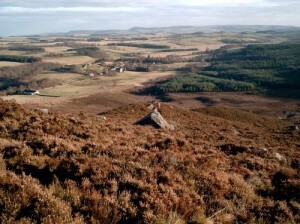 View towards Harbottle from the path. 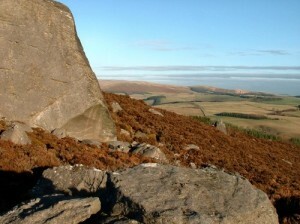 3) On reaching the Drake Stone the views to the Cheviot and Coquet Valley open up to form a superb panorama. 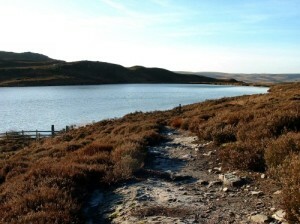 4) After exploring the area around the Drake Stone we took a path towards the north shore of Harbottle Lake which then followed the lake shore. We noted the M.O.D. 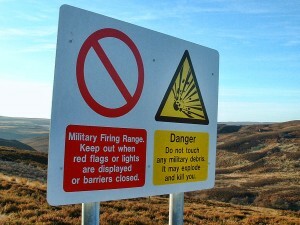 warning signs and flags in this area which was at the edge of the military firing range. 5) The lake is a very quiet and peaceful area but this peace was broken now and then when the army started target practice nearby with heavy artillery. 6) The path left the lake shore just before reaching the west end of the lake and from here we climbed uphill towards the forest (West Wood). 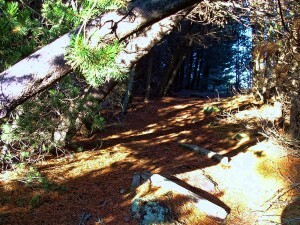 We walked through dense forest before reaching a clearing that we then walked straight across. The path then descended steeply in places before leaving the forest and joining a track where signs once again warned not to enter the restricted firing range area. 7) We turned right and walked down this track. To the north we enjoyed the views across the Coquet Valley to the village of Alwinton and the hills beyond. 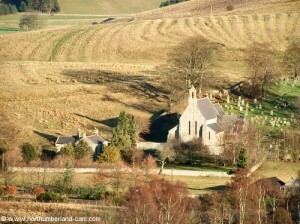 Alwinton Church was also visible from the track. View north from the edge of West Wood. 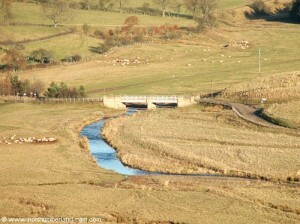 View to Alwinton from the return track. 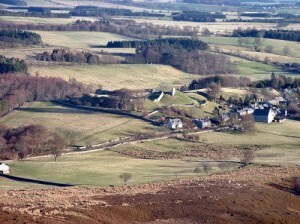 8) At the bottom of this track we reached the road from Harbottle to Alwinton. Here we turned right and walked back along the road to the car park. 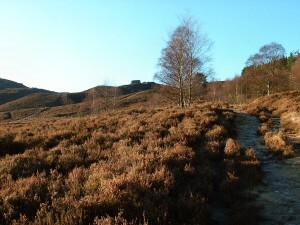 At the car park walk on towards Harbottle Castle (or drive to the castle car park). 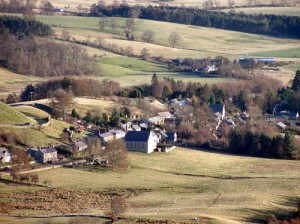 Harbottle Castle is perched on the top of a hill. There are only a few ruins now but it's importance in history is well recorded. There are excellent views from the Castle Ruins. 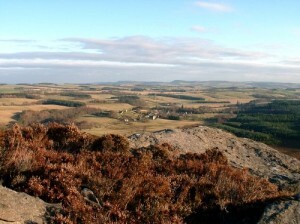 View towards Drake Stone from Harbottle Castle. 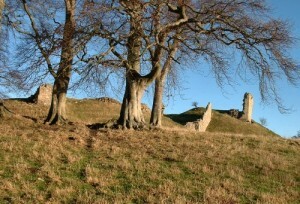 Part of the castle ruins. 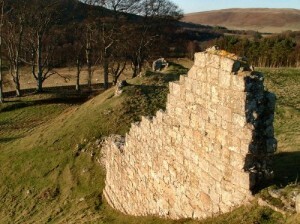 For larger pictures and some history visit the Harbottle Castle page of our Northumberland Photo Website. - Good walking boots advisable. 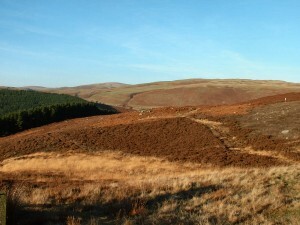 - Map - Ordnance Survey Landranger sheet 80, Cheviot Hills & Kielder Forest Area.